Introduction: “We have started to be obsessed with food, where it comes from, in what shops to buy it, and how to prepare it” . Although it seems to be a topic of interest reaching further than merely researcher, we still do not have proper real time data on what is eaten, where, when and why. For social researchers, nutrition researchers and food companies alike, proper insights on food intake is a crucial fundament to follow food trends. We can see trends in food coming and going, yet we do not have the proper data to follow, understand and eventually predict these trends. Insights in food intake up to the nutrient level and food sales data are often not linked. While the first gives insights into nutrient deficiencies and other health related topics, the latter gives broader insights into what is actually bought. Insights into where, when and why food is eaten is lacking. The difficulties into getting these insights are not the data itself, but rather the collection thereof. The measurement of food intake is a complicated and costly process. Nutrition scientists have focused on this issue and have offered multiple solutions. There are for example (short) food frequency questionnaires, national food intake data and technological developments to improve knowledge on the nutritional intake of people. Data that is consumer generated, large scale and for the purpose of consumer insights is however, still lacking. 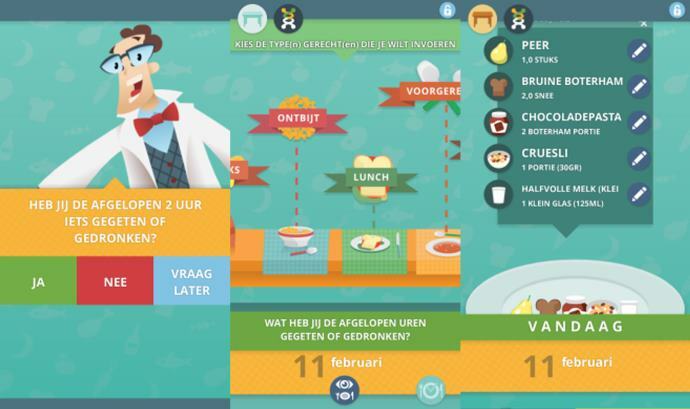 Aim: In order to fill this gap in knowledge the “WUR Food intake app” (working name) has been developed to collect consumer generated data on food intake and related determinants, in a reliable and user friendly way. 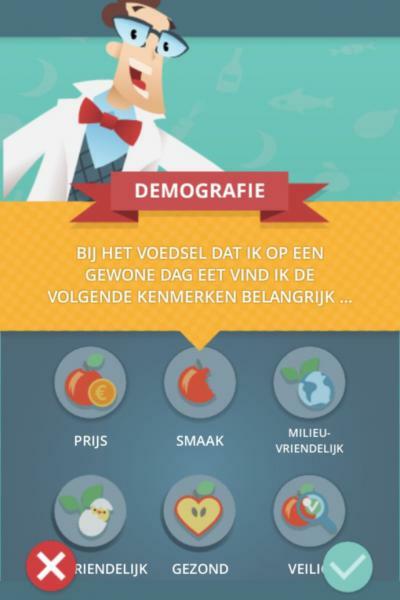 The food intake app provides a novel approach to quantify what people eat while 1) keeping a low data collection burden for the consumer, 2) relate it to food consumption motives 3) measure it real time and on the spot 4) and finally give insights into consumption patterns over time and location. Development: Recently, smartphone usage is so incorporated into daily life that it can be applied in the rapid deployment of consumer generated data. To lower the collection burden of food intake we focused on using a smaller timeframe to request consumer data. Where traditional methods focused on the past week or day (traditional 24-h recalls), we keep the recollection burden low by merely requesting food intake from the last 2 hours. Data from multiple 2 hour snapshots are aggregated to form a complete picture of consumption over larger groups. A second issue this shorter recall tackles is the recall bias, since it is only 2 hours, it becomes much easier to remember more precisely what has been eaten. Furthermore the design is consumer oriented: the look and feel is made attractive and the amount of steps needed to enter the data is minimized. An example of the consumer journey is shown below. Since users receive a pop-up to answer what they have been eating for the last 2 hours, a deeper insight into when certain products are eaten are attained. To motivate consumers to do this at the moment, they get rewarded with progression in their profile. In figure 3 an example of the profile is given. The profile is build up out of two parts, in the figure portrayed as a double helix. One part of the helix stands for progression related to the psychological and demographical questions while the other stands for the food intake data. The further the data is completed, the more feedback and fun facts about food the user gets, as shown below. The low burden on requesting information was also applied to the questions relating to socio-psychological insights. Where traditional methods make use of long questionnaires at a single moment in time, the Food Intake app spreads a short version over the same random intervals as for food intake. An example can be seen below, where the question is raised which constructs describe the choice for certain foods most. Together the intake data and the data on socio-psychological factors give insights into when people eat certain products, but also why they choose those products. Furthermore, the app is built in such a way that it is attractive to users to see their progression, and therefore they are stimulated to continue filling out their data over time. Which in effect gives insights into consumption patterns in relation to product combination but also over time. The consumers mentioned above can be participating due to different reason. Respondents can sign up out of own interest or consumers can be recruited. Although the two groups are not necessarily different when it comes to consumer behavior, their motivations and possibly representativeness are different and thus kept apart. Data: The second fundamental aspect of the data collection is the processing of the data. The development of the tool was closely interconnected to the RICHFIELDS project – a three year European funded project- where one of the focal points is to store consumer generated, real time data in a sustainable matter. In anticipation of the findings the back-end was designed with the goals of RICHFIELDS in mind. Food consumption data can be detailed and dynamic, which makes data analysis a time consuming process, especially when the data is designed to apply to a specific field of research. The dynamics of the consumption data lie within the different viewpoints of research fields. While the one wants to research the individual traits of consumers, the other is interested in consumption data of a certain product. Both questions can be answered with the data but the data have to be structured differently for both questions. For research purposes the data is static at the moment, while the back-end is continuously in development to give way to these multiple viewpoints in one data-tool. Below the back-end tool is shown where the data can be downloaded from our internal servers. The back-end is already set-up for different ways of looking at the data, from collecting all the data of what is consumed in all the consumer panels for aggregating total consumption for example, to insights into differences between consumer segments (related to food choice motives for example). 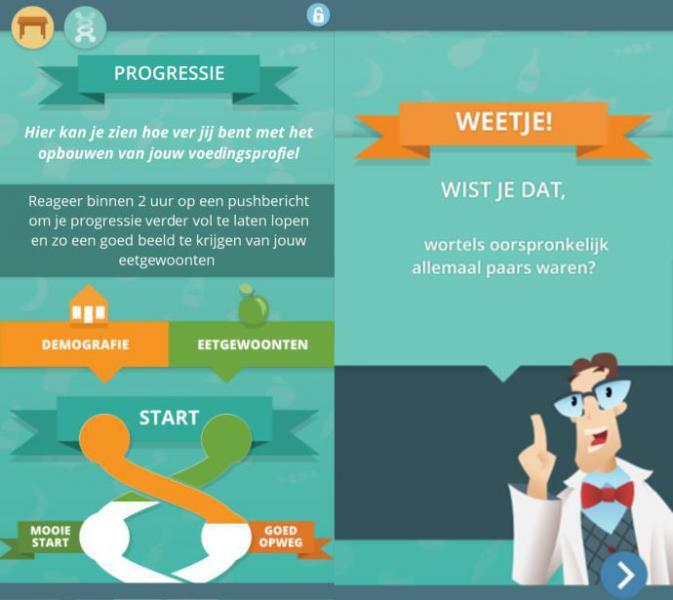 The WUR Food Intake app was developed to collect consumer generated data on food consumption and underlying determinants. The back-bone of the app relies on snapshots of food consumption, which can be aggregated over a larger population and thus give insights into consumption patterns, motives and trends. Furthermore, the back-end of the app is developed in such a way that it is user friendly to the researcher. Combined insights in food intake, moment, situation and motivations can lead to a better understanding of food consumption.